The second highest mountain range in the UK is a mountain range in the eastern Highlands of Scotland. In modern terms, these mountains are known as the “Cairngorms.” The Cairngorms include the highest, coldest, and snowiest plateaux in the United Kingdom. Five of the six highest mountains in Scotland come from this mountain range: Ben Macdhui (1309 m); Braeriach (1296 m); Cairn Toul (1293 m); Sgor an Lochaine Uaine (1258 m); and Cairn Gorm (1245 m). 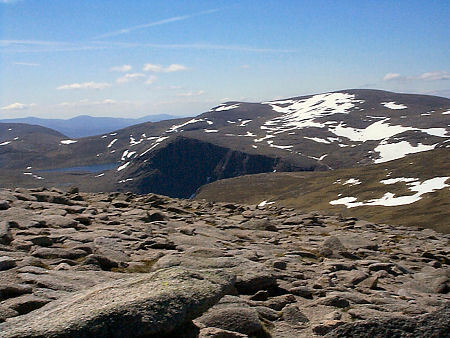 But our tale today is not one speaking of each of these mountains beings Munros, but the mystery surrounding Ben Macdui, for upon Ben Macdui’s summit, one might encounter the gaelic creature known as Am Fear Liath Mòr (meaning “Big Gray Man”). The tale goes that Am Fear Liath Mòr takes great umbrage with climbers who attempt to scale the mountain. The tales came before Professor Norman Collie chronicled his experience on the mountain, but the good professor’s story brought the situation to light. 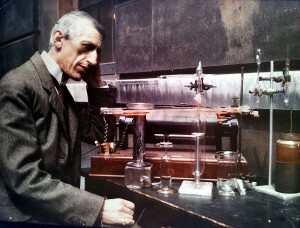 Collie was respected scientist and Professor of Organic Chemistry at University College London. He was the first man to use a medical X-ray photograph. Collie was also a Fellow of the Royal Society. “Alastair Borthwick’s superb 1939 book about climbing in Scotland, “Always a Little Further” relates the accounts of two climbers he knew who had experienced what by then was becoming known as Am Fear Lithe Mòr, or Ferlas Mor, or the Big Grey Man of Ben Macdui, because of its appearance when briefly glimpsed by a few of those who encountered it. ‘The first was alone, heading over MacDhui for Corrour on a night when the snow had a hard, crisp crust through which his boots broke at every step. He reached the summit and it was while he was descending the slopes which fall towards the Larig that he heard footsteps behind him, footsteps not in the rhythm of his own, but occurring only once for every three steps he took. ‘The second man’s experience was roughly similar. He was on MacDhui, and alone. He heard footsteps. He was climbing in daylight, in summer; but so dense was the mist that he was working by compass, and visibility was almost as poor as it would have been at night. The footsteps he heard were made by something or someone trudging up the fine screes which decorate the upper parts of the mountain, a thing not extraordinary in itself, though the steps were only a few yards behind him, but exceedingly odd when the mist suddenly cleared and he could see no living thing on the mountain, at that point devoid of cover of any kind. ‘Did the steps follow yours exactly?’ I asked him. He thought it queerer still when I told him the other man’s story. You see, he was long-legged’ and six feet tall, and the first man was only five-feet-seven. This entry was posted in British history, Great Britain, real life tales, Scotland, Victorian era and tagged Alastair Borthwick, Am Fear Lithe Mór, Ben Macdui, Big Grey Man, Cairngorms, Johann Silberschlag, mysteries, Professor Norman Collie, Scotland, Twenion. Bookmark the permalink. Thanks for sharing the post, William.